A stand mixer is to a baker what a batmobile is to Batman or the lasso of truth is to Wonder Woman. Yup, that is how big a role a stand mixer plays. After all, can you imagine the manpower your bakery business would need if you were to perform all the mixing and kneading manually? Well, luckily for you, buying a stand mixer isn’t that tough (well, at least not with us by your side) whether you are a professional, a home baker or just a hobbyist. Check out these reviews below and find out the best stand mixer in India for your needs and budget. 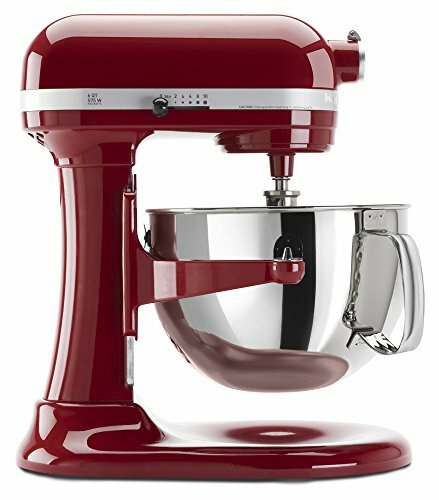 KitchenAid Artisan 5KSM150PSDWH: So you can churn out equally awesome cookies, cakes, pies, etc. day in and day out, the mixer comes with a 5.6-Liter bowl and 600W motor while the 67 touch action ensures your mixtures are just the way you want it to be for fluffy and soft cakes. 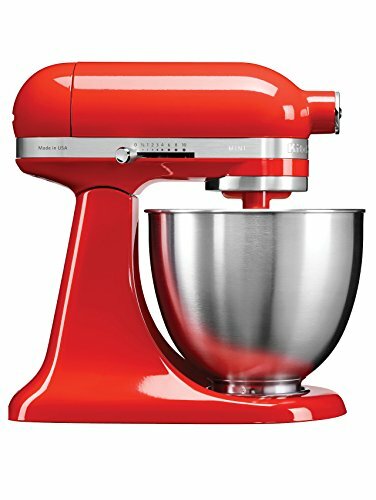 KitchenAid Artisan Mini 5KSM3311XBHT: Looking for a cheaper more compact stand mixer for home use that does not compromise on build quality or mixing efficiency? Well, your search ends with this 3.3-liter mixer that comes with a 59 touch point action to give the ideal mix for all your home baking needs. Are you looking to start your own baker and need a professional-grade mixer for it? Well, then this KitchenAid mixer is just the workhorse for you as it can prepare large batches of dough and cake batter all day long. The perfect mix is the building block of any lip-smacking cake or pie. This is why the mixer has a 67 touch point mixing action around the bowl for thorough mixing so your cakes are always fluffy and soft (just like your grandma’s). Furthermore to ensure that the mixer comes with multiple attachments which include a Dough Hook, Wire Whip and Beater. The beater attachment flawlessly mixes your cake premixes, sugar, butter, etc. depending on the recipe. Similarly, the dough hook attachment kneads the dough for cookies and even atta for rotis within minutes without any knocking. Thanks to its powerful 600W motor, the mixer delivers 10-speeds so you get all the control needed over the mixing while the soft start prevents any unwanted splatter. Lastly, with the 6 Quart (5.6-liter) stainless steel bowl, the mixer can deliver batter for 8 bread loaves and 13 dozen cookies (so you are not stuck whipping and mixing the whole day). The power hub at top of the mixer gives it unmatched versatility. How? By allowing you to attach 15 awesome attachments. These attachments include a mincer, ice cream maker, food processor, pasta maker, and so on. So from chopping veggies to making yummy making pasta dishes and ice creams, it is the all in one kitchen appliance even your grandma wishes she had. To provide additional stability to the bowl during all that heavy mixing there are special clamps on the pole and with the lever, you can conveniently change the bowl’s position. The stand mixer itself has a premium look and build and should easily give you 8-10 years without needing any repairs. The attachments are nickel coated for longevity while the stainless steel bowl is easy to clean as it is dishwasher safe and more durable than glass bowls. And in case you are superstitious about colors or simply have a preference you will be happy to know there are 13 colors to choose from. On the downsides, the stand mixer is on the heavy side so it will be taking a permanent place in the kitchen. It is also noisier than the other KitchenAid models and does not work efficiently with smaller batches of ingredients. The 6 quartz capacity prepares dough for 13 dozen cookies, 8 bread loaves, etc. 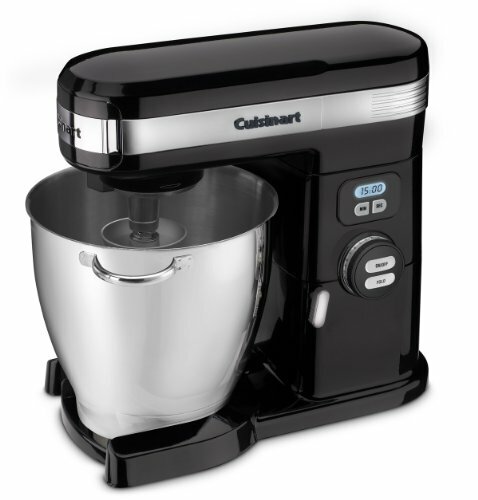 The Cuisinart SM 70BK is another beast of the mixer and offer even more speed and capacity than the KitchenAid. It has a 1000W motor and a 7Quartz capacity which means it can handle even bigger batches of cakes and cookies. Furthermore, it offers you 12-speeds with a slow start and a few gentle fold functions so your creams and egg whites are whipped to perfection each time. It also has a timer and thus you free to pay attention to other activities while the mixing is on while an auto shut-off feature helps save power. The only real issue with this stand mixer is the low motor durability as compared to the KitchenAid mixer. Plus, it will cost you higher as makes almost an equal amount of noise if not more. Nevertheless, if you want something more powerful and larger than the KitchenAid, this is the best alternative. Whether you are running a small scale home business or just starting out you do not need to spend lakhs on a stand mixer just yet. This KitchenAid mixer from the artisan mini-series combines the efficiency and sturdiness of the professional mixer into a cost-effective model. It is a smaller 3.3-liter mixer with a 250W motor which is ample power and capacity to deliver dough for 5 dozen cookies and batter, batter for 3-4 bread loaves and cakes. But does the lower motor power and capacity mean compromising with quality? Well, that is where the stand mixer excels. From consistent batter and dough to airy egg white, the 59 touch point action is primed for just that. Plus, there are a total of 10 speeds. Though speed 8-10 don’t have much different having 8 effective speeds should easily get any mixing job done with ease. And since hereto it begins with a soft start so you do not have to worry about cleaning mess as it ensures no splashing. The smaller size also means the stand mixer takes less space on the countertop and is almost 50% lighter than the Professional Stand Mixer. Yup, this one weighs just 7kgs and thus is easier to move around if need be. Also, unlike in case of bowl lift design, here it is easy to scrape excess cream or batter from the attachments with a silicone spatula. That is because you no do not have to remove the bowl completely anymore. This also makes adding ingredients from other bowls less tedious. While you get the regular beater, Wire Whip, and Dough hook to further amp it up, you can purchase tons of other attachments as this mixer also features the versatile power hub (it will turn into your go-to appliances for every need). The build of the mixer is impressive as well and will give you seamless mixing for about 8 years without any overhead expenses. Plus, you can find tons of colors making it easier to find one that matches your kitchen’s interior. The stainless steel bowl is equally sturdy and being dishwasher safe makes for easy cleaning once you are done with all the mixing. Like everything in life, even this mixer isn’t flawless. Firstly, its tilt-head design means the mixer cannot be run while under a cabinet so you will need to free up space for it before buying. Attachments do not match up to the quality of the professional mixer as the nylon coating tens to chip off with time. 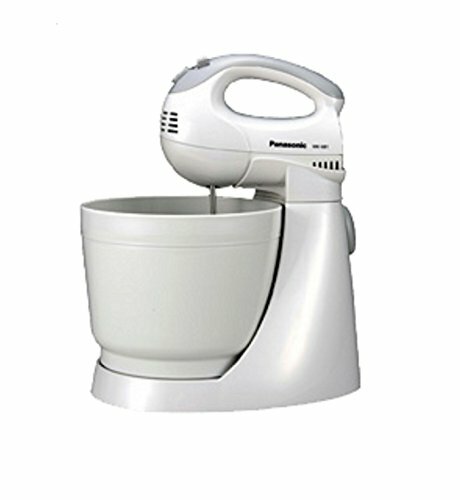 If you are confused between buying a stand mixer or a hand mixer, the Panasonic MG-GB1 offers the ultimate solution. Since it can be used both as a stand mixer and hand mixer it is perfect for both medium to small mixing tasks (now, enjoy the best of both worlds). If you want to go hands-free, just attach the 3-liter bowl to the base and the mixer to the stand and voila, just like that you have stand mixer in minutes. And when you want to quickly beat a couple of eggs for the morning breakfast or whip up a nice dip to go with the evening samosas, the hand mixer mode comes in handy. Using it as a hand mixer is also pretty comfortable thanks to the ergonomically designed handle. While larger mixes may take time with the 5-speed settings, eggs and dips need just seconds to whip or blend. This quick mixing is further supported by the 200W motor. To make all the mixing easy, you are provided with a stainless steel dough hook and beater that can be dumped into the dishwasher for hassle-free cleaning. Also, since it can be all detached, putting the mixer away is easy peasy when not in use (it will even fit into a drawer). Plus, it weighs a mere 2kgs and is the lightest stand mixer on the list so moving it around the kitchen should be no trouble at all (you don’t need your hulk mode on for this one). Let’s not beat around the bush, this mixer is no KitchenAid. The motor isn’t powerful enough for larger batches and neither does it offer a wide range of speeds (seriously, it won’t even knead atta for you). While the plastic build of the mixer, stand and the jar is good enough for everyday use, there is really no scoop to be clumsy as it may instantly break in case you drop it. Also, there are is no soft start or splashguard so overfilling the container and starting a higher speed is sure to mess up your kitchen. So with all those flaws, is it still a good buy? That is because for less than Rs. 3,000 you get a multi-purpose mixer that is quite efficient when it comes to mixing smaller batches of ingredients for cakes, cookies, and eggs. And since you would be using it occasionally and considering you do not drop it, the mixer should last you well beyond the warranty period. Lastly, stand makes it easier to use than traditional hand mixers as you can focus on other tasks while the mixing is on rather than having to hold it the entire time. 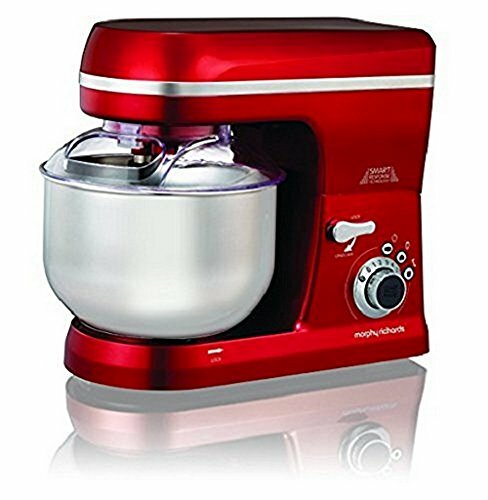 Morphy Richards offers one of the best mid-range stand mixers for novice bakers and goes toe to toe with the Artisan Mini in terms of features and efficiency. The standout feature of the Morphy Richards has to be the Smart Response Technology. With load sensors, the mixer automatically adjusts the motor power and speed to give you a perfectly consistent mix (it is like the stand mixer has cruise control). Setting these modes means the mixer will automatically set speed and power (just hit the button, sit back and enjoy a cup of coffee). But if you prefer to be in charge of all the mixing there also 6-speeds and pulse button that comes in handy when you need short bursts. In case you need to check the cream or add ingredients like an essence or color you can use the pause button so it starts off with the same settings. The 800W motor in tandem with the 5-liter stainless steel bowl makes it an ideal mixer for home bakeries capable of delivering 4-5 cakes and about 6-7 dozen cookies. Another awesome feature is the special splashguard which makes up for the lack of a soft start feature and effectively prevents any splashes. The pocket in the guard keeps the mixture aerated and allows you to safely add some colors, essence as well without stopping the mixer. With the mixer, comes 3 attachments. The beater attachments for cakes, the whisk for meringues and cream and lastly, the dough hook for cookies and pies and even atta. All of these attachments and the mixing bowl are made of stainless steel thus guaranteeing long years of service without chipping or breaking. Plus, it also makes them dishwasher-safe. You also get access to Morphy Richard’s recipe app known as Cook and Create where you can find tons of recipes that you make using various Morphy Richard’s products. Lastly, for a large mixer, it is pretty compact but more importantly, weighs just 4kgs so moving around should be a breeze. One of the major drawbacks of this stand mixer is that it is quite noisy which some users may find really annoying. Also, it is not as versatile as the KitchenAid mixers since it does not have that many attachments and neither the speeds. Since the mixer has a tilt-head design, you will need to place it in an open area, unlike bowl lift mixers that do not need much headroom. Thankfully, it is lightweight and thus can be moved around easily before and after the work is done. Well, as you can see some stand mixers aren’t for the bakers. With multiple attachments, KitchenAid mixers make the perfect ice creams and will even chop and slice vegetables for you. While most of the other mixers are great for beating eggs for other purposes, knead atta, make dips and sauces, etc. But since these mixers do not come cheap it is important to read get in-depth details on the pros and cons of each mixer so you know exactly what you get for the money spent. And this guide aims to do just that for you. In case you have any questions or would like to talk about a stand mixer you have been using for your business and home, do write to us in the comments section below.